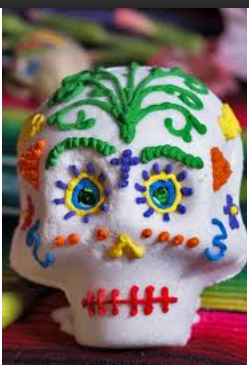 Day of the Dead in Mexico is a celebration combining Christian devotion and pre-Hispanic customs to honor the dead on the firstst and the 2nd of November. The living celebrate the lives of deceased ancestors. The tradition is that the dead visit their families and this is a very joyful holiday there! What is this party? Four words to sum up: guitar, violin, skulls and calaveras (skulls). Giant colorful parades and roaming the streets. Go to the first scene of the last James Bond Spectre and you can get a taste of the festive mood! Families clean and decorate the graves with wreaths of colorful flowers: mainly with orange and yellow Indian flowers that are also called the “Dead Flower”, but also many roses and sunflowers. To honor the dead, the family prepares altars on which are deposited offerings. In Mexico we think children are visiting souls on the 1st of November and the adult souls return the next day. The Mexicans prepare a typical recipe known as”Pan de Muerto,” which when translated means “bread of dead”, a sweet roll with different shapes: skulls, flowers, and bones. The calaveras (skulls) are treats made out of sugar and chocolate, sold in traditional markets called “Todos Santos”, “all the saints”. The deceased’s name is written on the front of the skulls and then they are eaten by relatives or friends. The tradition is to buy candles, fruits and flowers in the markets. People can also listen to traditional music. 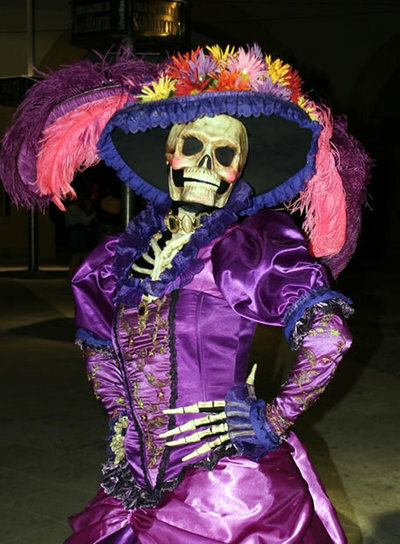 On the floor, flower designs are scattered to represent symbols of death, such as skulls ..
One of the important figures in this festival is the Catrina, a female skeleton wearing a stylish and ample hat. It can be found represented in paper mache, cardboard, sugar … whatever, the Catrina portrays humor for Mexicans who have faced the death of loved ones. 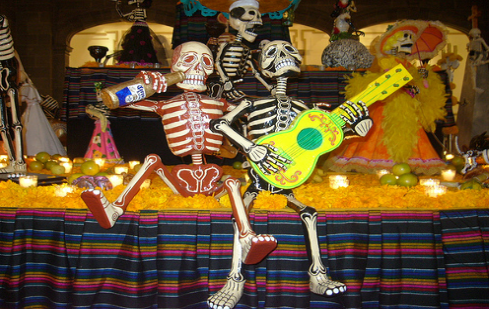 So, do you prefer the Day of the Dead in France or in Mexico? To find out more about original traditions, you can search online. www.caracolade.com/5-traditions-colombiennes-originales.